of a project of this size. I have known and worked with Greg Tchamitchian and Aim Group Construction Management for several years and on a wide range of diverse and complicated construction projects. Greg and his team recently oversaw and ran with complete professionalism a $17 Million dollar project that our company developed in Charleston, Illinois. The project consists of a 36 acre parcel with 67 houses that was constructed for students, complete with park, basketball courts, Gym and “state of the art” telecommunications in each family room and student bedroom. It is with complete confidence that I am able to recommend Greg as one who is exceptionally competent in his field with many years of board and in depth experience in his profession. Greg’s organizational and communication skills along with his ability to interact professionally with others always brought a level of management experience to the field. He is a true professional in displaying sound and analytical judgment. His reliability and dedication to his projects was always foremost in his work. Aim Group Construction was the contractor for the build-out of our current offices in Schaumburg, Illinois in 2004. We were completely satisfied with their performance in the construction of our project. They proved themselves to be committed to total client service and satisfaction and maintained the highest levels of skill, integrity, quality and responsibility in professional services for us. Greg Tchamitchian and his organization's professional dedication to quality service and follow through allowed us the confidence to leave • details in their hands without the need of our staff to "touch" things multiple times. 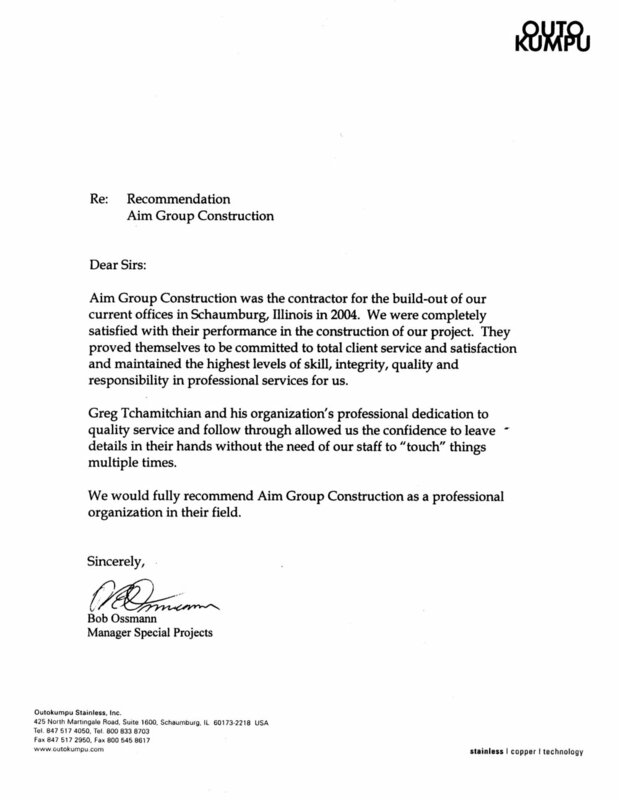 We would fully recommend Aim Group Construction as a professional organization in their field. The purpose of this letter is to express my heartfelt gratitude to Greg Tchamitchian for his invaluable help in resolving a dire situation with a Chicago apartment building owned by my daughter who lives in Atlanta. An unscrupulous realtor/contractor left the major renovation of her building in an incomplete uninhabitable condition. She faced a seemingly insurmountable problem. However, through the efforts of a friend, my daughter was able to enlist Greg's help. I felt such relief and confidence after meeting and discussing the problem with him. His competence, professionalism, and patience were evident from the first moment and throughout every step toward the resolution. Knowing we had him on our side certainly made the bad situation bearable. We owe him many, many thanks for everything he did to help my daughter with her Chicago property. He went beyond our expectations to make sure everything, from faulty design documents to city permits and fine notices, was untangled. We can never repay him for his gift, but hope he knows he has our undying appreciation. Aim Group Construction Management recently completed work at our corporate offices in downtown Chicago. They are a professional organization with excellent management and a high level of customer service. It was a pleasure to have them on our property running the job. They delivered what they promised when they promised. We would gladly call on them for future projects. 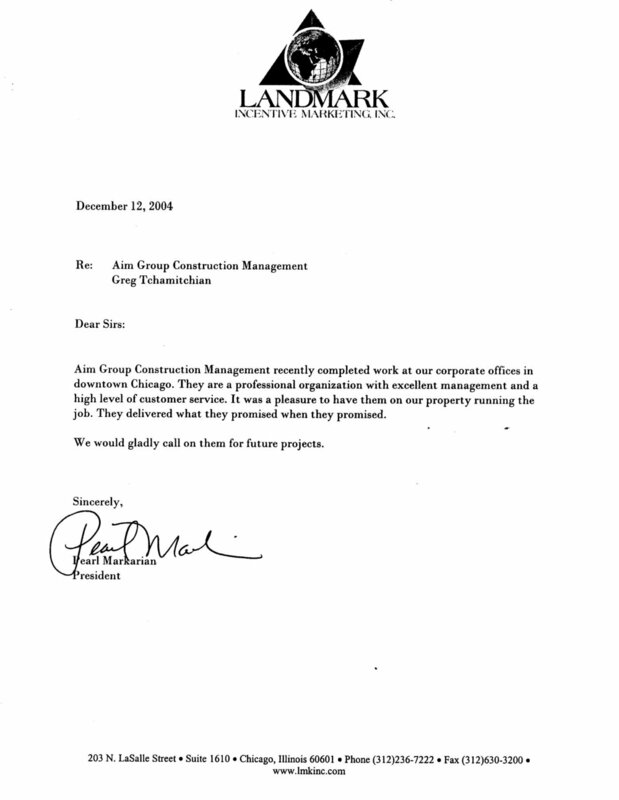 I am writing this letter in regards to the general contractor Aim Group that was responsible for the construction of our new offices. Their performance in the construction met all our expectations. They were professional and service driven in meeting the deadlines of the project. Their team was "hands on" and quick to respond to all our needs as they arose. I highly recommend Greg Tchamitchian and the Aim Group Construction for any construction projects you have. We will certainly call them in the future. Based on our experience and complete satisfaction with Aim Group Construction we would highly recommend them as a professional service driven organization. Greg Tchamitchian and his staff demonstrated extensive knowledge and experience in their field. Moreover they proved to us to be a team of highly qualified and responsible professionals dedicated to 100% customer satisfaction. Without any hesitation we would call on Aim Group Construction for any of our future project needs.